You are here: Home / Materials / Spray Foam for a grade 2 listed building in Yorkshire..good idea? Spray Foam for a grade 2 listed building in Yorkshire..good idea? A large roof can take some looking after. One way which has been promoted to help keep slates in place is foam, sprayed on the underside of the slates and laths. many don’t like it…it just seems wrong. Especially in this case when it’s been used in an 18th century grade 2 listed building in North Yorkshire. I was called in to check the roof for a potential buyer. The RICS chap had condemned the entire roof on the basis that this foam had been used. I found some light infestation by common furniture beetle but generally the roof timbers were fine. However, there was a bit of staining here and there and moisture meter readings from the exposed rafters confirmed some of these were leaks. Externally there was some evidence of the odd slipped slate and this did correspond to the stained and damp areas. However, I though I’d do some investigation work on the unstained and apparently dry areas, as a way of checking out people’s opinions; that the spray foam can trap moisture in, which on face value seems a logical position to take. Using a combination of deep probes and eventually by picking some foam away, to confirm what I was finding, the following results were found. The upper sections of the rafters and the slate laths were almost all on the damp side, ranging from 19 to 28%. Now then. The roof is old so I don’t think the laths are heavily treated with a salty preservative so why the high MC? As can be seen the roof void was being assaulted by twin bathroom extractors venting into the void..never good. So maybe that wasn’t helping. Could it be though that a high MC is there due to the reduced ability of the laths to dry out after getting wet, through inevitable condensation on the underside at night? This seems likely. Anyway, I didn’t agree that a new roof was in order, but I have put the new owner on notice that regular planned maintenance is an essential part of looking after this building and maybe the life of the roof may be shortened by the presence of the foam. Wow. Interesting case – thanks for sharing Brian! HI young Bryan as it was a pre mortgage report was the property empty and if so how long for ? As you stated the fans should be vented to open air, but if the bathroom fans were used during showering then obviously the MC of the timbers would go up. But wouldn’t the moisture content go through the roof during the cold winter months due to heavy condensation forming on the underside? I have found this stuff sprayed under a timber floor before now to prevent drafts, and there was surface moisture all over the underside, on the foam. As a Listed Building, provision of the foam should have been the subject of listed building consent. It is highly unlikely that such consent will have been provided in this instance. This is therefore criminal damage & the Conservation officer can insist on removal. Such action is likely to require replacement of the roof with slates to. Match. The surveyor was therefore correct! It’s good to get a conservation expert’s opinion – thanks David.. My advice in this case is purly based on the damp and timber issue. As far as I know the surveyor didn’t raise the listed building consent but clearly there’s a risk of a loss for the buyer in that respect – I’ll point this out to them (this one is still pending). Looks like the original surveyor was accidently correct. I don’t think I would condemn a roof with foam to the underside out of hand; just point out the problems. At the end of the day the foam has been used because the roof is beginning to deteriorate and the owner couldn’t or wouldn’t afford to replace it. The foam may prolong the inevitable but the inevitable will happen and the costs will be higher than they would have been. I have read a number of your articles Bryan and find them very useful. I have never been happy with under roof foam because gut instinct dictates that foamed timbers will retain / absorb moisture from a variety of sources. On the listed building issue, I am sure that most experienced surveyors would have challenged the presence of foam. As David Rawlins pointed out, carrying out works to a Listed Building without prior LA approval could cause existing or future owners serious legal problems / restoration costs. I have been reading about cavity wall ties on this form with interest, our property in Whitby requires the wall ties be replaced. I am struggling to find a company willing to quote without charging £150+ for a survey which l would like to avoid for fear of laying out for an expensive quote. Would you be interested in the job? We are lokking to get the work done asap as the rest of the house needs completely renovating and clearly the ties need replacing first? I’ve asked my office manager to talk to you about this and I’m sure we can help you. Foam in a slate roof, is asking fro trouble unless you wish to replace timbers. A stone slate roof or blue slate relies upon through air. Stone will inveriably be held in place by oak pins and blue by copper nails. Good product that I have used is the silver backed (I call it space blanket) super efficent and still allows that flow of air to keep things dry. and remeber if it is stone to back point with either lime mortar with hores hair of a 3 to one with one of silver sand or all silver sand. Not happy with foam as once water gets in it runs and runs and is a devil to stop. “In early 2011, a prospective purchaser of a Grade 2 18th century listed building asked for our opinion, in historic building terms as local planning authority, about works done in 2006 within the attic space. Sprayed-on foam insulation had been applied to the underside of the clay peg-tile roof throughout, between the rafters from eaves to apex, effectively isolating the entire roof structure internally. The owner had passed away and the executors selling the property had inherited this problem. 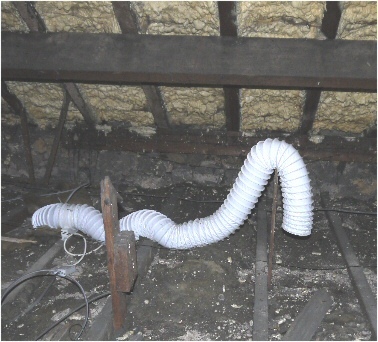 From an initial internal inspection it was not clear if the roof had previously been under-felted (it transpired it had not), but if it had beeb, then foam would normally have been unnecessary for the purposes of insulation, and the attic space had already been conventionally insulated between the joists some years before. It was presumed that the foam had been applied to prevent water ingress, although this would have been better addressed by under-felting in a breathable felt. The foam had been bonded to the underside of the tiles – as is the case with most products of this type – and could not be separated from the foam without damage to the tiles. Enquires with a selection of other local authorities and English Heritage did not identify any previous cases of foam insulation being used on a listed building (although one other case has emerged subsequently). Our concerns also extended to the impact of this technique on the prevention of any air circulation to the roofing batterns, resulting in them remaining wetter for longer after heavy rain, potentially leading to accelerated decay and eventual loss of tiles. Within the roof, it was possible that condensation and humidity might increase the possibility of fungal or insect attack. Accelerated decay of the encapsulated timbers became evident when the roof was subsequently stripped. The Council took the view that this work would be likely to be detrimental to the character of the Listed building. Further, Listed Building Consent should have been applied for prior to this technique being used but this would have been likely to have been refused. As Consent had not been sought the works were unauthorised. This was conveyed to both the executors of the deceased and the prospective purchaser. It was agreed between the Council’s Conservation Service, the executors of the owner and the purchaser that we would place an Informal Notice on the Land Charges Search about the unauthorised works and then served on the executors by agreement a Listed Building Enforcement Notice, copied to the prospective purchaser who would then undertake to comply with it (resulting in a commensurate renegotiation of the purchase price). The LBEN works were carried out successfully in July to September 2011 and the Notice discharged. In the event some repairs to rafters were required especially at eaves level and only 10% of the clay plain tiles were salvageable. The building was almost completely re-roofed in new hand-made clay plain tiles. Documentation from the executors showed that (unsurprisingly) the insulation contractor had gone bust, that their 30 year guarantee was equally unsurprisingly) worthless. It is instructive that the building could have been completely underfelted and re-roofed in 2006 for 40% of what the insulation company had charged to spray the roof space.